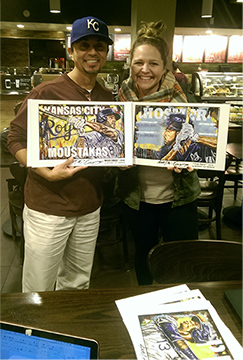 In a coffee shop in Mission, Kan., Kansas City artist Anthony “AO” Oropeza hands about 20 prints of his original Royals sports art to a young woman he recently saw on TV. On Sept. 11, 2017, Oropeza was watching the Royals play the Chicago White Sox when things went from ugly (the Royals were taking a beating) to uplifting. But this time, hometown heroes of another kind were changing up the game. 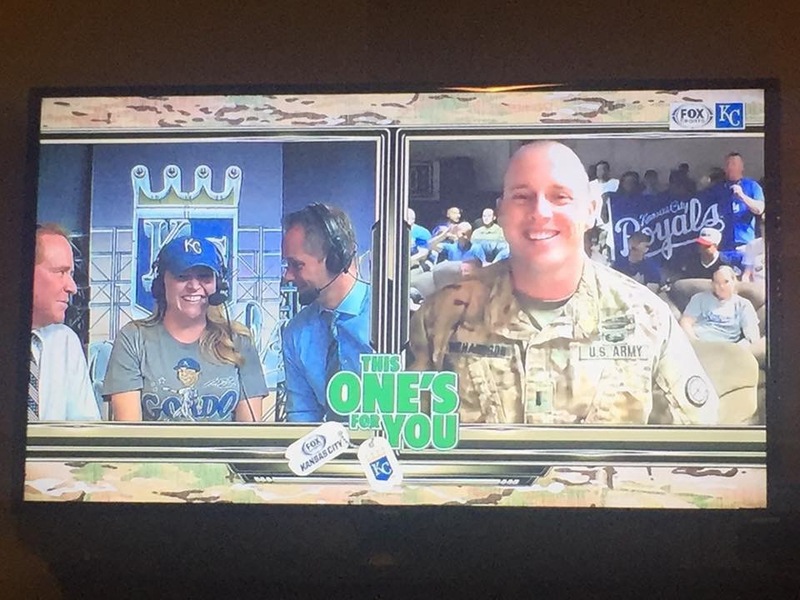 Troops from the Kansas and Missouri National Guard (and Royals fans), stationed in Kuwait, were joining the broadcast for Armed Forces Night at the K. And one of those troops’ wives got to be interviewed live with her husband during the broadcast with Royals announcers Ryan Lefebvre and Rex Hudler. 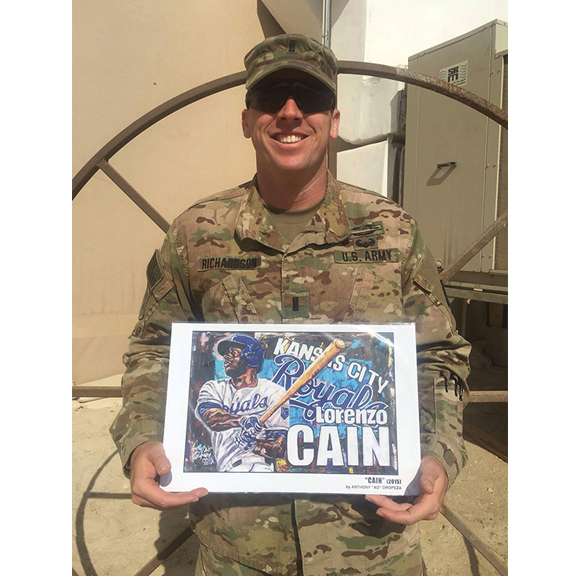 Anthony, a lifelong KC resident and Royals fan, is a sports artist who has been enjoying recognition from both Royals fans and players. This year, Jarrod Dyson of the Seattle Mariners (and former Royal) acquired one of AO’s recent originals, and Royals first basemanEric Hosmer purchased two prints on canvas of his work. A few months later, the Pujols family commissioned Oropeza to paint “Albert’s 600th,” a 5 ft. x 4 ft. mixed media piece commemorating Los Angeles designated hitter Albert Pujols’ 600th home run. Albert’s wife, Deidre, has since used the painting to help generate fundraising for her foundation, Open Gate International. Realistic and intense athletes in mid-action poses set against his signature abstract backgrounds give his paintings a vitality that often has fans remarking that the player looks like he’s popping of the canvas. On a table in the coffee shop, Mike Moustakas swings away on a stack of prints of AO’s original Royals artwork, while Lindsay Richardson tells the story of how she and James met and about the Armed Forces Night at the K. Her face is open and engaging, and she speaks with a sincerity and likability, even at the end of the day. Lindsay and James met at Cerner. Lindsay is a Kansas City native and James is a First Lieutenant in the Missouri National Guard and is originally from Oklahoma. They dated for three years before they got married in March of this year. In April, First Lt. Richardson was off to Camp Arifjan, a U.S. base in Kuwait. This is his fourth deployment with the National Guard. When asked if she knew she was going to be able to see and talk to her husband live on air during the game, she smiles and says, “No.” You can still see the surprise in her expression. A liaison from Fox Sports had been in contact with Lindsay on Sunday, the day before the game, and she figured she might be interviewed. But she had no idea that she would be interviewed simultaneously with her husband, First Lt. James Richardson, in the booth with Ryan and Hud. Because they were being interviewed on live television, Lindsay explains, they couldn’t really talk to each other, but kept giving each other small waves. When she demonstrates a little hand wave, it’s hard not to think about how the couple was hardly married for a month when James had to depart for service in Kuwait. She says everyone was taking bets on how long it would be before she cried during the broadcast. But it had all been so sudden and unexpected that it wasn’t even until a few days later that she realized that James had known they would both be interviewed, and that they (he and Fox Sports) had kept it a secret to surprise her. That’s why, when Anthony had contacted her and asked what she thought about sending James and his fellow guardsmen and Royals fans some prints of his Royals artwork, she decided to get him back with a surprise of her own. When AO asks her what she thought when he contacted her about donating the prints, she says tears came to her eyes. It’s no wonder, considering how much a part of their lives the Royals have been. Lindsay says that she and her family have always been Royals fans, and that even though James had been a fan from afar in Oklahoma, where he was originally from, when they began dating he became an even bigger fan. In the exciting 2014-15 seasons, they went to games and kept up good luck superstitions and traditions like going to Jimmy John’s before games. They even went to spring training with a group of couples. The Royals had been a part of their life together so far, and after the Armed Forces Night at the K, the Royals brought them together when they were oceans apart. Lindsay has decided to surprise her husband and his fellow troops with the artwork. He and the Fox Sports crew had surprised her with a live, in-the-booth interview that she had no idea was going to happen, so she figures she owes James by surprising him with the Royals prints by AO. Oropeza loves the idea that James has no idea about the surprise prints. Catch AO, his sports art and comic book art at the Nov 10-12 Kansas City Comic Con … and check out his work on his Facebook account. UPDATE: Nov.10, 2017 – From Lindsey to AO: “Hello there! The package finally made it way to Kuwait. James loves it! He said he is getting the guys together for a photo…”. Package received just in time for veterans day. Happy Veteran’s Day to all overseas and inland servicemen! 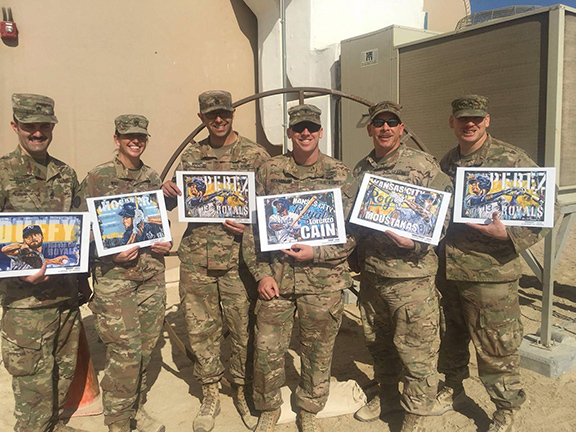 The prints received in Kuwait by James and fellow servicemen & servicewomen!